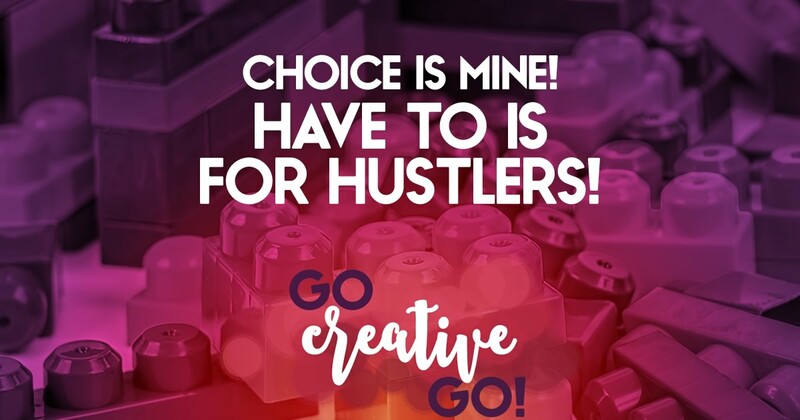 The Choice Is Mine: HAVE TO Is For Hustlers And Henchmen! I don’t HAVE TO do anything! But I absolutely, positively, no freaking way, HAVE TO market my business exactly how someone else markets their business. You know the saying, opinions are like a**holes, we all have one? It makes a point, albeit in a crude way (which I, of course, rather appreciate). But when someone tries to push their opinion on you as fact, as the ONLY way to act or move forward, that’s when things get rather sinister. Belligerent blanket statement utterances don’t make you better than anyone else. They don’t make you a better marketer, designer, businessman/woman or human being. Quite the opposite actually. Blanket statements can make you appear rigid, out of sync, behind the times, even downright clueless. is that there’s no single right way to go about achieving your aims and attaining your goals, especially via digital marketing measures. While I do live to alliterate, there’s more to my title than word flow. My way or the highway tactics leave me cold for a variety of reasons, but never more so than when these tactics are touted as “good as gold” go-to gems for digital marketing and design success. Remember all the old school SEO companies promising page one search ranks back in the day? OK, a few of the really less than legit are still doing so today, but I digress. Shysters all. And it took a lot of time, effort and writing article after article for the legit SEO companies and individuals to drive this point home. These great people have great ideas, products, services and more. They have so much to offer. Then they fall prey to a “Have To” huckster and, sadly, they lose a little of the light that made them shine so bright. It’s been said many times, by MANY a savvy social media marketer … there’s no ONE-SIZE fits all solution that will reap you immediate reward and everlasting fame and fortune. There are NO marketing gods. Every marketer out there has a few failures notched on their bedpost. Dig a little deeper into these hustlers tactics and you’ll often find they fail to walk what they’re talking. Let’s Halt The HAVE TO Hustle! There’s really no room for song and dance shenanigans in social media and digital marketing. That whole trust, honesty, transparency trifecta should have put the kibosh on these klutzy maneuvers. Yet, they still abide, and, in some instances, abound. Each business has its own personality, its own story, its own voice. It stands to reason, then, that each business should have its own marketing and design style. Of course there are best practices that we all must consider implementing. But even best practices can bend a bit, be flexible. When you design and market your business and brand with the best intent and purpose, you’re on the right path, even if you break a few “rules” and dance to the beat of your own drum. http://www.gocreativego.com/wp-content/uploads/2015/06/GCG-pinnable-have-to-hustlers.jpg 1080 735 Mallie Hart http://www.gocreativego.com/wp-content/uploads/2016/07/GCG-sitelogo-new.png Mallie Hart2015-06-18 12:52:102016-10-07 16:48:26The Choice Is Mine: HAVE TO Is For Hustlers And Henchmen! Hell yes to this, Mallie! I am a firm believer in letting your inner-rebel do its thing as you build your business. Test things, trust your instincts and let advice be nothing more than a guide (not a rulebook). Thanks for the comment and agreement, Whitney. Especially in digital marketing circles, we’re bombarded with “my way or the highway” marketing tips that don’t factor in the individuality of either the entrepreneur or the audience. I’m not a fan of blanket statements. I believe that there’s plenty of gray between the poles of black and white. Thanks for taking a stand on this issue, Mallie! Lately I’ve been alarmed at the number of people who can’t seem to understand why everyone doesn’t think like / behave like them. I have to let go and choose not to die on that battlefield – I don’t have enough energy to explain their foolishness to all of them. I so wanted to embed the Sid Vicious cover version in the article, but I didn’t. Maybe I’ll add it on for future shares! I so loathe blanket statements. When did we decide that digital marketing meant following the herd and losing our individuality along the way? And, if everyone is already doing something, it’s the last thing I want to do. Keep zigging when others zag, Mallie. Sure, you’ll make the occasional misstep, but they’ll be yours not someone else’s and you’ll easily correct and move forward. And please PLEASE keep up the snark! I don’t think the snark is going away anytime soon, Katherine! Thanks for chiming in, Katherine. You’ve known me long enough to know that I’m not going to allow blanket statements and/or moronic MUST statements to go unchecked. It’s our duty as social marketers to share the social mores that really matter. Blanket statements are almost always moronic and none more so than the ones about digital marketing. And that’s what makes digital marketing so exciting — trying to stay at least one leap ahead of others and trusting instincts at least as much as research. So thank you for policing the must-do claims. Yes, it’s a snarky job, but you’re just the woman to get it done. Love your attitude, Mallie. I’m tired of chasing shiny objects and following a bunch of marketing sameys telling me exactly what to do! Absolutely love that many a reader thought of “My Way” when reading. I really did consider adding the Sid Vicious cover when I was prepping the article for publish. Shiny object syndrome and social media marketing often go hand in hand, but we can fight the good fight and realize that what works for our audience is really all we need to consider. Web Design Wonderful: Pretty Is As Pretty Does! Thank You: Appreciation And Acknowledgment Rock!